Back at Comic-Con this year, Steven Unvierse’s joint panel with Adventure Time treated fans to an extended version of the show’s opening theme, teasing an awesome hint at the show’s future. Now Cartoon Network have started streaming the opening on their website, so everyone can see it! The minisode recalls the first time the young Steven moved in with the Crystal Gems at their beachside temple (hastily converted into an actual house with the help of Steven’s Dad, Greg) as the adorable little Steven sings his own version of the show’s main theme. It’s a great little ditty, which is just one of the many reasons you should be watching Steven Universe anyway! 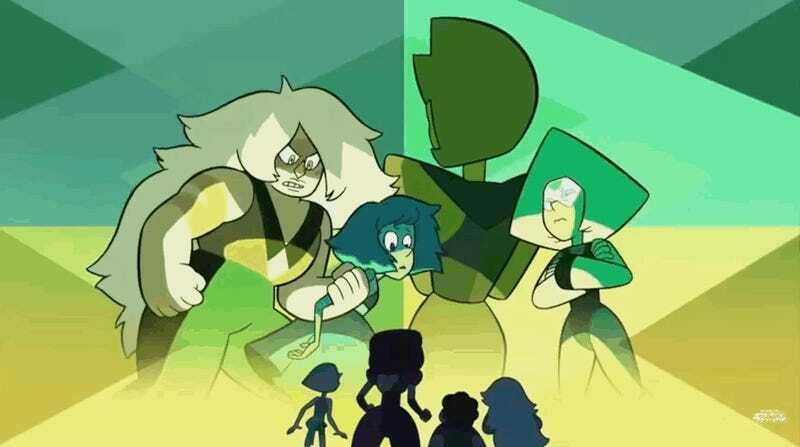 As the montage of clips from the show fades away however, we get our first good glimpse of a new additions to the bad guys of Steven Universe: Homeworld Gems Peridot, Jasper, and the captured Lapis are joined by the shadow of their leader, Yellow Diamond! Yellow Diamond has been teased a few times as the show has begun to delve into its backstory a little more, but it’s cool to actually see her for the first time. Hopefully we’ll get to see her soon enough: Steven Universe returns with a new batch of episodes this Thursday on Cartoon Network.